Mervyn Stone, creator and script editor of the classic science fiction series Vixens From The Void (basically Dynasty in space), doesn’t do an awful lot these days. Most of the time, he’s mooching from convention to convention signing souvenirs from the show, mostly for the same people over and over again. So when he is asked to write a script for the revival of the show as a series of full-cast audio plays, he leaps at the chance. Oh, I forgot to mention that Mervyn has solved a few murders in his time – so he races to the studio… and I’ll have to stop the synopsis there. Oh, there is a third actor, someone who’s appeared on a lot of Big Finish CDs before, but I’ll say no more about that for reasons that will be obviously when you listen to the play. And you simply must listen to the play. Right, let’s be fair. 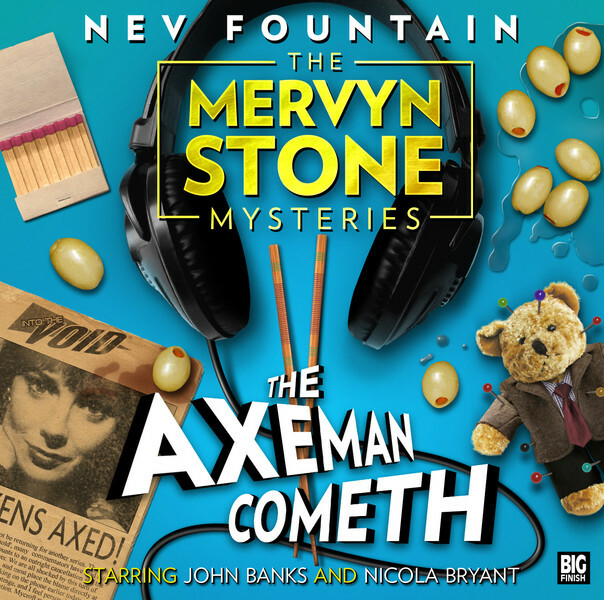 Anyone who’s read my previous reviews of Nev Fountain’s work, including the blatant plug for this play, will know that I absolutely love not only his Mervyn Stone canon – three books, one twitter novel and a series of podcasts – but his Doctor Who audios as well – Omega, The Kingmaker and Peri and the Piscon Paradox. You may think that I’ll praise to the hilt anything written by him. So, in the interests of balance, I didn’t love his recent Doctor Who book, Trouble In Paradise. Oh, it was good, and the Columbus character made me laugh a lot, but it wasn’t anything outstanding. Merely good with some very good bits. OK, that’s the balance corrected. The Axeman Cometh is the best murder mystery that I have seen, read or heard for absolutely ages. When presented with the opportunity to record an audio play, Nev has constructed an astonishing story that makes complete use of the format – indeed the format itself is part of the plot. I really cannot go into any of the reasons that I love the plot without spoiling it, and I would hate to do that. But there is an idea here, brilliantly executed, that ranks with those “special” novels, the one-off never-to-be-repeated ideas such as The Murder Of Roger Ackroyd or And Then There Were None. I honestly do not think that’s overstating the cleverness (and simplicity) of this play. Seriously, if you’re a fan or murder mysteries (and if not, what on earth are you reading my blog for?) or cheesy old science fiction, you simply must get this CD. It’s available from Big Finish Productions and rest assured, you will not regret it. Not just Highly Recommended, this is a masterpiece of crime drama. Spread the word! All downloaded and waiting to be played during my morning commute – so glad to hear it more than stands up – I’m such a fan of Fountain it’s great to hear that he’s pulled off another winner – huzzah! Look forward to hearing what you think about it. Have you read the books yet? No, not yet – as all my stuff is in storage I don’t know when I’ll get round to it, but I will – been saving them up for ages. Not necessary to have read them beforehand is it? Listened to it today Steve – and it is as utterly splendid a you said it would be. I’ll run a quick review too if I can. But I was disheartened to read in the booklet that this is the end of the road for Mervie – this can;t be true, can it? I was looking forward to a box set from Big Finish darn it! Can’t you have a word with Signor Fountain, please? Let’s hope – Mervyn may only be an amateur but Nev’s the real deal! Right! I’m buying this when I get home. I didn’t like the first Mervyn Stone book, the one at the convention (too much like Simon Brett), but The Kingmaker and Omega are both brilliant.